What is your primary search engine right now? If you’re like most folks, then you’re probably using nothing but Google Which Search Engine Should You Be Using Today? Which Search Engine Should You Be Using Today? There are many search engines out there, but which one is the best for you? Read More — and that’s fine, except maybe Google isn’t the perfect search engine for your needs. 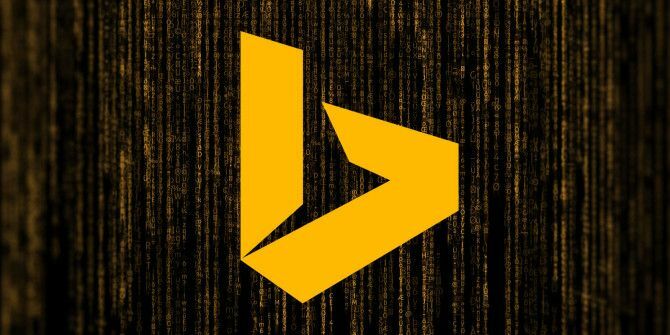 People like to hate on Bing, but it turns out that Bing has some cool features that set it apart Greater Than Google: The Best Bits Of Bing Greater Than Google: The Best Bits Of Bing When we think of searching the Internet, we without a doubt think “Google”. And why not? It’s a fantastic search engine and has some great features. But even before the idea of writing this article,... Read More , including the Bing Rewards program Get Paid To Search With The Bing Rewards Program Get Paid To Search With The Bing Rewards Program Google is king, but Bing is pushing its case. The Bing Rewards Program helps you earn credits while you discover the Web. It's a simple way earn little rewards for your browsing. Read More as well as an impressively accurate prediction intelligence How Bing Predicts Has Become So Good How Bing Predicts Has Become So Good Time to quit your day job and start gambling via Bing Predictions? Not quite, but let's have a look at how Bing has become just so good at predicting the future. Read More . To be honest, I’m quite surprised by Bing. And here’s another neat little quirk that you might like: Bing has a built-in speed test widget that you can access with a simple search query. All you have to do is search Bing for speed test or speedtest and you’ll get this simplistic but useful widget. Click Start to begin the speed test and you’ll soon find out how fast your download and upload speeds are. There are other ways to test your speed The Internet Speed Test & 7 Ways To Improve Bad Results The Internet Speed Test & 7 Ways To Improve Bad Results Read More , of course, but this is just so easy. Unfortunately, even though the widget should work internationally, it may or may not work for you depending on your specific location. Give it a try regardless. The worst that can happen is… nothing. If it doesn’t work, try another browser. How fast is your internet connection? Share your results with us below! And don’t forget to try the Bing Rewards program What's Bing Rewards, How It Works, And What's New? What's Bing Rewards, How It Works, And What's New? The premise of Bing Rewards is that you can earn credits for searching with Bing. Read More if that’s something that interests you. Explore more about: Internet, Microsoft Bing. Except it doesn't work. It told me I have download speeds of 26Mbps. Sorry, I'm on a 1Mb DSL.